The Sacrament of Baptism leads us into the divine life, cleanses us from sin, and initiates us as members of the Christian community. It is the foundation for living our faith. Parents must be registered parishioners and attend mass regularly. Before having your first child baptized, parents attend Baptismal Preparation. Planning a Baptism? Contact the parish office at 618.397.2287 to inquire about pastor and church availability. Most parishioners receive the Holy Eucharist for the first time in second grade. Receiving the Eucharist is a blessing from God. It unifies the Community of Believers and strengthens the Body of Christ each time Communion is received in reverence with a prayerful heart. In order for your child to understand how very special the Sacrament of Holy Eucharist is, they must attend a Catholic School or Parish School of Religion (PSR) classes for an entire year prior to receiving the sacrament. Adults can attend Rite of Christian Initiation Adult Classes (RCIA) prior to receiving sacraments. At confirmation we receive the gifts of the Holy Spirit and confirm our baptismal promises. Greater awareness of the grace of the Holy Spirit is conferred through the anointing of chrism oil and laying on of hands by the Bishop. Children are confirmed during their 8th grade year. To receive the sacrament they must be enrolled in a Catholic School or Parish School of Religion (PSR) classes. Adults must be enrolled in (RCIA) classes prior to receiving the sacrament. In the Sacrament of Reconciliation, we seek pardon from God’s mercy for offenses committed against him. This is achieved through four important steps: Contrition, a feeling of remorse and a conversion of heart; Confession of our sins to a priest; Absolution, in which we receive and accept forgiveness; and Committing to go forward and live a Christian life. Reconciliation is available from 3:30-4:00 p.m. Saturdays at Blessed Sacrament Parish or by appointment. The Sacrament of the Anointing of the Sick was previously most commonly administered to the dying, for the remission of sins and the provision of spiritual strength and health. In modern times, its use has been expanded to all who are gravely ill or are about to undergo a serious operation. The Church stresses a secondary effect of the Sacrament: to help a person recover his or her health. The Sacrament of the Anointing of the Sick can be repeated as often as is necessary. Please inform the parish office of any parishioner or loved one who might be ill at home, in the hospital or in a care facility. Arrangements can be made for a visit from Father Matt for the Anointing and receiving Holy Communion. 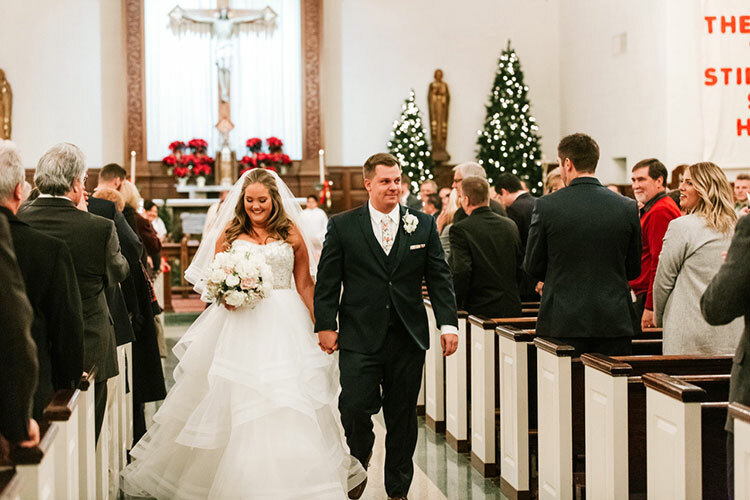 We recommend contacting the parish office at least six months prior to a planned wedding. Weddings are held on Friday or Saturday. Due to confessions and Mass schedules, Saturday weddings must begin prior to 2 p.m. or after 6 p.m.
Planning a Wedding? Contact the parish office at 618.397.2287 to inquire about pastor and church availability. “Ordination” comes from the Latin word “Ordinem”, which means to incorporate someone into an order. In the Sacrament of Holy Orders, a man is incorporated into the priesthood of Christ, at one of three levels: the episcopate, the priesthood, or the diaconate. For information about receiving any of the Sacraments, please contact the parish office at 618-397-2287. Planning a Wedding or Baptism? Contact the parish office at 618.397.2287 to inquire about pastor and church availability.